In the last section I said, "Reformed Theology has no North Star other than the ever-changing winds of human conclusion. While they claim Bible authority, the truth is that the teaching of reformed leaders such as Luther, Calvin, Zwingly, and scores of modern-day Calvinists are always used as the filter through which they interpret Scripture. Without a rock-solid, unmovable anchor point (biblical harmony), doctrine becomes the proverbial beach ball. Everyone tries to keep it aloft by poking at it with their own versions of human opinion." In this section, let's take a look at one example of these human opinions. "…God gets as much glory out of His wrath as He gets out of His grace…." Some time ago, I came across this quote by one of today's highly respected Reformed Theologists. I have to admit that one of my first thoughts was, "Really?!! How tragic! Islam teaches the same thing!" Q: Does God receive glory through wrath? A: Perhaps indirectly. Romans 9:23 does indicate that God's glory is made known through wrath. The harmony of God's Word gives balance to that idea. Remember, the very best Bible commentary is the Bible itself. Let God's Word interpret God's Word. "‘As I live,’ says the Lord God, ‘I have no pleasure in the death of the wicked, but that the wicked turn from his way and live.'" So what about the quote above? Does God get "as much glory out of His wrath as He gets out of His grace"? Only if you are trying to prop up the perverse doctrine of original sin. I believe this quote and the promotion of it is a man-made conclusion drawn from tunnel vision rather than a God-made conclusion drawn from the harmony of Scripture. For more information about the way Romans 9 harmonizes with the rest of Scripture, please visit http://www.heybrothersonny.com/predestination.html. 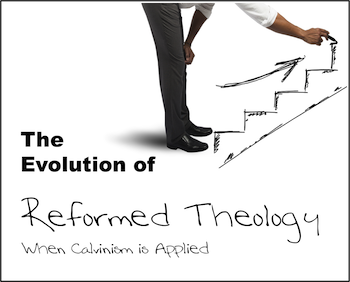 The Evolution of Reformed Theology: "When Calvinism is Applied - Part 1"
The Evolution of Reformed Theology: "When Calvinism is Applied - Part 4"
Back to Top of "The Evolution of Reformed Theology: When Calvinism is Applied - Part 3"